This is gonna be one of those weekends!!! Not only is the weather INCREDIBLE here in the A but the Braves (who are on a pretty decent winning streak) are playing at Turner Field, the NBA Playoffs are kicking off (our hometown Hawks are making their fifth consecutive postseason appearance), AND last but certainly not least is the Taste of Marietta. 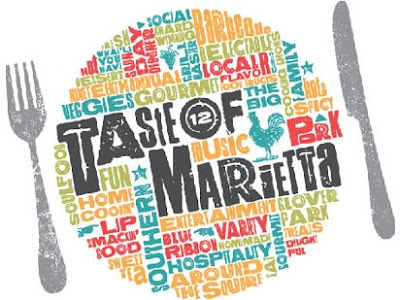 Going down tomorrow (Sunday) in the Historic Marietta Square from 11am - 7pm, Marietta's "Taste" boasts over 80 participating restaurants and vendors. Hopefully this will be enough to accommodate the more than 70,000 people that are expected to attend. There will be live entertainment all day as well as games and activities for the kids. Admission is free but food will be sold at prices ranging from $0.50-4.00. Side Note: What could possibly be on sale for $0.50?? Lol. For more information, check our their official website or LIKE them on Facebook. There's a good chance that you'll catch a few members of the ATL Bite Life team there a little earlier in the day partaking in the festivities. Come say hi and take some pictures with us.